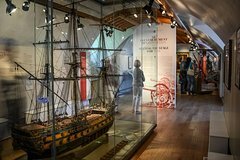 Spanning more than five centuries, History and Memory features themes that range from navigation and maritime trade to day-to-day life in New France. The almost 500 objects, documents, and rare books in the exhibition, some displayed for the first time, are showcased on two floors of the Museum.The exhibition takes visitors on a trip back through time, beginning with the first inhabitants of St. Helen's Island and ending with portrayals of the island from the mid-19th century to the present day. Our collective past is a mosaic of the history of Aboriginal peoples, France, the United Kingdom, the United States, and society’s major discoveries, among others. All have fed our imaginations and will forever be part of our individual and shared memory. History and Memory offers an historical journey that takes visitors from the Aboriginal era to the present day. Visitors will delight in seeing our history unfold in all of its facets. Key themes such as the Reformation period and religious wars, the adventure of living in New France, the Enlightenment, navigation, maritime trade, industrial revolution, and the Patriots rebellion are all portrayed. The focus is also on the history and heritage of St. Helen's Island, an apt reflection of the Museum’s effort to bring together local, national and world history. The exhibition has reserved a place of honour for the award-winning «model displaying the fortifications of Montreal», with visitors treated to a one-of-a-kind interactive experience. The model, held at the Stewart Museum, was fully restored in 2011, features interactive technology that combines historical analysis with illustrations from the Stewart Museum collection. Visitors are now able to literally “touch” history.